Phoenix was a mythical bird of Ancient Egypt which reputedly burned every 500 Years and rose rejuvenated from its Ashes with renewed youth to live another cycle. This word is used as a symbolic for a person or thing who is regarded as uniquely remarkable in some respect. Similarly, our Hospital is named as Phoenix because it is a never ending organization which will exist and run successfully always. Like the Phoenix Bird, it will take re-birth again and again with a much more enthusiasm in better Hospital. Phoenix is a multi-specialty hospital which is a venture of Prayag Health Care where Prayag is the old name of Allahabad, a city known for its confluence of 3 rivers Ganga, Jamuna and Saraswati called as ‘Sangam’. Allahabad is a peaceful, cheerful and clean city with lots of greenery adding to its beauty. Phoenix Hospital is the First Wide ranging Multi and Super-Specialty Hospital of this city with the mission to provide Quality Medical and Health Care. Phoenix Hospital is a unit of Prayag Health Care And Research Centre Pvt. Ltd., one amongst the best healthcare institutes in the eastern Uttar Pradesh. Phoenix is the genesis of the dream seen ten years back by few Super-Specialists of the Allahabad city to provide superspeciality services under one roof. The dream nurtured and grew within the founder directors of Phoenix Hospitals Dr. Sanjay Asthana, Dr. J.V. Rai, Dr. Dhanesh Agrahari, Dr. R.K.Sinha , Dr. Gupta, Dr. Alok Mishra, Dr. Vibhav Malviya, & Dr. Neogi until the point of culmination happened in 2012. Phoenix hospital has been designed as an energy efficient building that complies with the ECBC (Energy Conservation Building Code) and sustainable design concepts have been incorporated in different aspects of the building design. Phoenix Hospital is situated in the heart of city in Tagore Town, in front of Colonelganj Inter College near Anand Bhawan & Balson Crossing. It offers a convenient location for Patients, their Attendants and Families. Phoenix hospital has centrally air-conditioned OPD block facilitated with round the clock Pharmacy backup & a big waiting lobby with nice ambience & comfort. 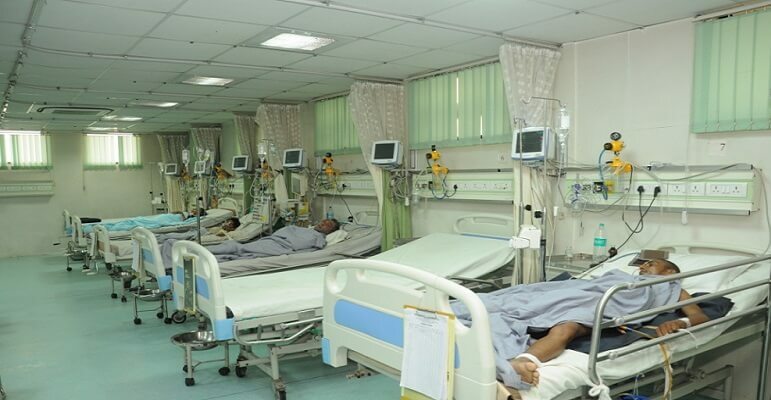 It has 100+ beds including 16 bed I.C.C.U, 8 bed N.I.C.U, 6 bed P.I.C.U, well equipped high dependency surgical unit, dialysis unit, General Ward, AC Semi-private, Single AC & Deluxe Room. It has O.T Complex of five Operation Theatres with advanced Gastro endoscopy unit equipped with latest Anesthesia work station, defibrillator, monitors, Multi-Para monitors & C-Arm device for more precision. Our key focus is the patients’ wellbeing. Our Hospital has all the facilities that a patient requires during their stay. High end ICUs are supported by devoted nurses for each bed. They ensure focused, intense & personalized care. Phoenix hospital has centrally air-conditioned OPD block facilitated with round the clock Pharmacy backup & a big waiting lobby with nice ambience & comfort. The administrative structure and the allocation of resources are designed in such a way that it is completely patient centric. Conforming to the very best medical practises around the world and at the same time making sure innovative methods are employed wherever necessary and applicable.